BIAFRA: WE SHALL RESIST YOU - YOU ARE BETRAYALS, IPOB TO IGBO ELITES ON THE UPCOMING BUHARI'S SPONSORED "IGBO SUBMIT"
“We are not part of and cannot be part of the fraudulent so called All Igbo Summit scheduled for next month at Uturu, Abia State. It is specifically for the group of ex-this and ex-that who had earlier planned to host Nigerian President Muhammadu Buhari in our region, until they were told that such mindless scheme could only lead to bloodshed, have now resorted to telling everybody that they are planning for our future at the so called All Igbo Summit." “Everybody is wondering why these shameless political hustlers suddenly woke up now and are determined to hold a summit. Their planed summit is not unconnected with their fears that they have become irrelevant in the scheme of things, hence their struggle to make themselves reinvent by hoping to become relevant with a completely unhelpful summit, that would achieve absolutely nothing." “As we boldly march on to freedom from the 50 years slavery and oppression visited upon us, by the internal colonialists with the active collaboration of the same so-called leaders over the decades who are always rewarded with crumbs, while our region remains deliberately under-developed and isolated, they are trying to repeat the same game all over again, game of cheating themselves with crumbs while other regions develops in geometric progression." “They had 46 years to plan the future of our region, all they did was subvert and undermine group interest all the times for their personal interest, they all pursued individual accommodation in all the failed and oppressive governments of Nigeria, since 1970, both military and civilian." “These leaders without followers plot their senseless and useless summit at Uturu, as usual with the blessing and active support of Aso Rock, we advise them to be guided accordingly, that 99% of our people both old and young, have seen through their heartless and evil scheme for decades, we have endured their abuse and trade-off of and sell out of our future for personal gain for 46 years." “We are all victims of their ruthless exploitation and selfishness and we will not accept their evil ventures anymore. We are saying never again will these shameless horde of political hustlers, use us again to warm themselves into Aso Rock Villa. 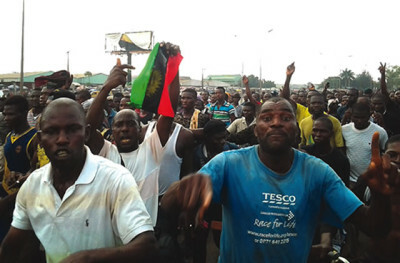 The dilapidated infrastructure and the killing of the peaceful unarmed members of IPOB in Biafraland, their directionless leadership, and the painful vacuum they created by their spineless and rudderless leadership in our region led to the frustrations that crystallized to our desire for freedom from Nigeria."